A slight increase in wader numbers today with 38 dunlin, including the first juveniles, 13 knot, 115 turnstones and a green sandpiper. The quail was singing by Holland were the red-backed shrike was still present and 2 collared dove also. 2 crossbill were at the airfield and a swift and grey heron were seen. 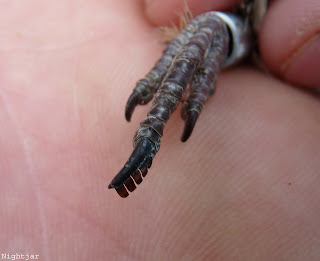 Both the red-backed shrike and quail were still by Holland, a kestrel was at Westness and 2 collared dove at Kirbest. Waders in the south of the island included singles of ruff, greenshank, whimbrel and green sandpiper, and 2 crossbill were noted. 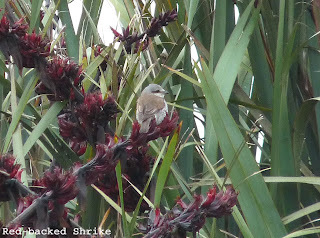 The red-backed shrike was again in Holland garden and the quail was heard singing. A crossbill was by the airfield and 8 storm petrel and 4 manx shearwater were seen on a seawatch. A male crossbill was at the airfield, a whimbrel was at Rue and other bits included a red-throated diver, a collared dove and 35 sanderling. 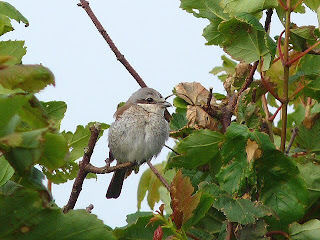 A female red-backed shrike at and around Holland was an unexpected arrival, the quail was heard singing again in Mid Park. 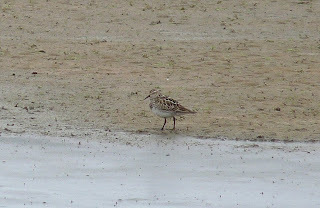 8 whimbrel flew south, a common sandpiper was by the seawatch hide and singles of crossbill and chiffchaff were seen. 11 sanderling were on the Links, 5 crossbill flew over Twingness and a grey heron was seen. Very little coverage today but an adult pectoral sandpiper was on Gretchen Loch in the evening. A quail was singing again in fields south of Holland, a minimum of 3 swift were seen and a great northern diver flew along the west coast. 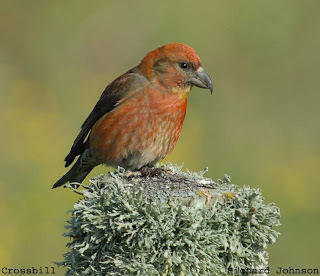 Mist lingered throughout the day and the only notable sighting was of 2 crossbill over the observatory. New waders on Gretchen Loch included a summer plumage curlew sandpiper, 3 knot and 2 greenshank, whilst the nightjar was seen again at Holland. Seen at sea were a manx shaerwater and 2 storm petrels. 12 manx shearwater and a risso's dolphin were seen at sea in the morning and at Holland were the nightjar, a chiffchaff and a crossbill. A grey heron flew over Twinyas and a kestrel was at the north end. A leach's petrel was the highlight of near 3 hours seawatching, with 41 manx shearwater also. The nightjar remains at Holland House and 2 cross bill and a swift were seen. 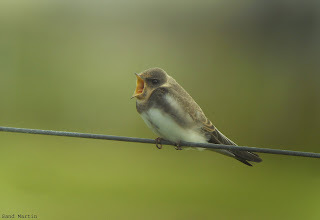 For the first time ever on North Ronaldsay a pair of sand martins successfully bred on the coast at Hooking, fledging one young. 330 fulmar, 2 storm petrel and 23 manx shearwater were all seen on hour seawatch at the north end, 12 crossbill were at Greenwall and another at Holland. 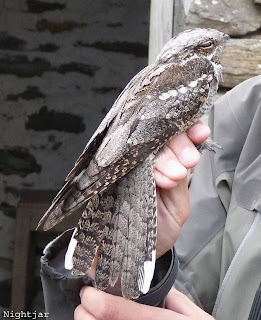 The male nightjar at Holland was trapped in the afternoon. A grey heron was at Hooking and in Holland were a chiffchaff and a crossbill. The male nightjar was still in Holland garden, 2 crossbills were at the Observatory and an hour seawatch produced 6 manx shearwater, 243 fulmar and 194 gannet. Amazingly, Monday's nightjar was again seen at Holland, 43 crossbills were mostly confined to the airfield area and a grey heron was at Hooking. 2 manx shearwater were seen from the north end, a hobby shot through Loch Park in the afternoon and a whimbrel flew over the Obs', whilst today's crossbill total was 28. 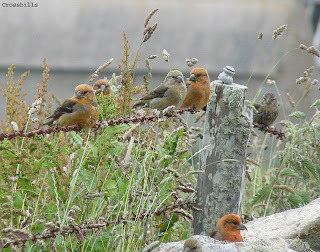 42 crossbills were mostly by the Airfield and Kirbest, the golden plover flock had near doubled to 617 and a grey heron and manx shearwater were seen. The biggest surprise of the day though was of a male nightjar at Holland late evening. A total of 18 storm petrel and 1 leach's petrel were trapped overnight. 2 purple sandpiper were by the Pier, 2 knot on Gretchen Loch and 331 golden plover in East Loch Park. A chiffchaff and 3 collared doves were at Holland, the collective total for crossbill was 40 and 4 swift were overhead. 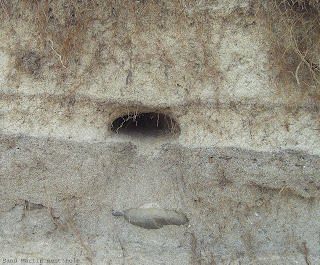 17 storm petrel and a leach's petrel were trapped overnight. A single manx shearwater and storm petrel were seen from the north end and the curlew sandpiper and 2 black-tailed godwit were on Gretchen Loch. However, the main event of the day was an impressive count of 144 crossbills, of which 114 flew through south. A male common rosefinch was singing at Holland in the morning, and a curlew sandpiper was on Gretchen Loch with 16 dunlin. A curlew sandpiper and 16 dunlin were on Gretchen Loch and the golden plover flock now stands at 156. 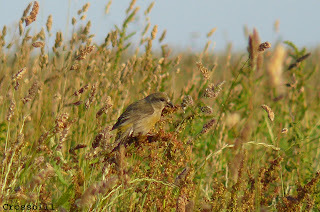 A chiffchaff was at Holland, and also seen were a swift and 3 crossbill. 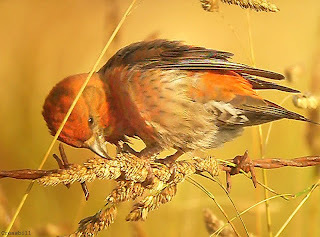 17 swifts were over the Observatory and single crossbills were at Loch Park and the Airfield. 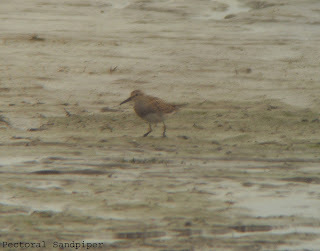 A whimbrel was at the north end and 2 little tern were in Nouster Bay. 3 knot, a black-tailed godwit and 19 dunlin were on Gretchen Loch, 3 collared doves were at Holland and a chiffchaff at the Surgery. Over Hooking were 3 sand martins and 3 red-breasted merganser were seen.